A a quick follow up to earlier posts about supplements, here is an article about t hose supplements on store shelves. Buyer beware! Every day at work I am struck by the fact that the majority of patients I see have preventable illnesses. While genetics may predispose some of us to certain conditions, it is not inevitable that we succumb. When dietary factors are ignored and we fall ill, it is often too late. We might improve or manage the condition, but rarely will we eliminate it once it has taken hold. Research suggests that the risk for obesity can start as early as exposure in the womb. While it doesn’t doom someone to a lifetime of fighting it, it does predispose a person, meaning vigilance is even more important. The symptoms of heart disease and diabetes can be improved by weight loss. One is more energetic when feeding the body properly and getting exercise. It’s never too late to begin. Take just one small step forward. Change just one thing toward improved health. When a habit is entrenched, take another small step. You will be rewarded with better quality of life, not only immediately, but in your golden years. Supplements are drugs! But since they are unregulated, you can’t be sure you are getting what you think! Look for supplements that carry the seal of good manufacturing process, which indicates the brand follows voluntary quality standards. As with other drugs. Check for food-drug interactions of all prescription and over the counter medications and supplements. Is a rainy day – just right for cooking! Everyone gets to eat well and you get another healthy recipe! Note: Although the sauce tastes deliciously rich, it is nearly fat free! Quick to make and very elegant. Serve with a green vegetable and some nice new potatoes, either boiled or roasted. Blend the yogurt, mustard, honey, lemon juice, and dill,in a bowl. Cover, and refrigerate until time to serve. 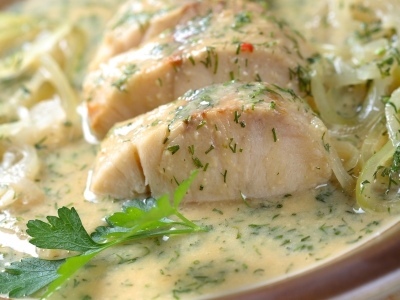 Place the salmon in a saucepan with the white wine and water and shallots. Make sure the fish is covered. Add more water if necessary. Cover the saucepan, and cook over medium heat 10 to 12 minutes, until salmon is easily flaked with a fork. Drain, and top with the yogurt sauce. If you like to socialize, love good food and are interested in improving your healthy eating habits, I have an idea for you. What better way to do this than by sharing your journey with other like-minded people? 1.Locate and invite enough people to ensure a good number at each event, but keep in mind how many can be comfortably accommodated at each member’s home. Decide how often you all want to meet: monthly? quarterly? Create a schedule, rotating homes. The host plans the whole meal, prepares the entree and picks up the beverages (alcoholic or not or both). S/he delegates the side dishes, desserts, salads, etc. according to the meal plan. Everyone contributes their share of the whole cost at the end of the meal. Simple? What’s so different than any other dinner club you may be wondering? Here’s is the catch: The recipes have to be low in fat (compared to the norm; we are not getting crazy!). That means no cream sauces that use real cream. Thicken them with starches or by reducing the through simmering. Use healthy fats/oils: butter no or limited. Olive and canola? Yes. Meals should contain reasonable portions: a variety of vegetables (filling half the plate), 3-4 oz of animal protein, or alternate protein if you feel daring enough to find a good recipe. Try tofu (it comes in many textures), beans or add more veggies. Your grains should be whole grains or starches like sweet potato, and fill less than one quarter of the plate. See “myPlate for may ideas, recipes, calorie counts, tools to track your calories, activity, weight, etc. www.choosemyplate.gov. Eating well and enjoying good food IS possible with a little effort. Best of all, sharing the time with your friends is really what nourishes your soul. The meal is a healthy bonus and gift to your bodies. I am hoping to make this an interactive site. I would love your participation in the quest for health through good food and habits. I have a science-based degree in dietetics (nutrition) and a degree in applied psychology. I believe most eating issues have a strong psychological component and must be addressed when there are weight challenges. It is a whole new world, with so much information in the public domain. Some of it is helpful and science based. Some is outright quackery. The volume of information can easily overwhelm any conscientious reader. There are many fads and some just plain dangerous things being sold. Understand there is no magic pill, no quick fix and no diet that will keep you at a healthy weight after weight loss. Reframing “diet” to mean how we eat all the time eliminates the “magic” that presumably happens when you are shedding pounds. Diet is a way of life, for the rest of your life. Eat a healthy diet and you will never have to worry about being on a diet. See the difference? This blog will be filled over time with sane, relevant advice and resources, so you can begin to change your diet, and thereby, your health. Come along with me on this journey. As always with my blogs, feel free to comment, ask questions or contact me personally if you want to connect privately.